The one thing you will absolutely need when going to Disney are park tickets. However, it’s not as easy as walking up to the gates and buying your tickets to get in. Sure, you can do that, but it is not the most efficient way to purchase tickets. Base park tickets are for guests that plan to only be in 1 park per day. You can purchase from 1-day, up until 10-days of entry. Each day, you can go to any of the 4 theme parks, but you can only go to 1 in a day. You can however enter multiple times during the day to the same theme park. For example, if you go to Magic Kingdom in the morning and take a break at your hotel in the afternoon, you can still return to Magic Kingdom in the evening with a base ticket. I find base tickets work best for first-time visitors. Disney has a lot to see and it can be very overwhelming to try and do more than one park in a day if it is your first time. Also, if you have very young kids, they may not have the stamina to do more than 1 park in a day, so base tickets are probably your best option. A park hopper ticket will give you more flexibility since it allows you to go to more than 1 theme park per day. If you are a veteran visitor or have older children, this type of ticket might suit you well. I always get the park hopper because I like to have the option to go somewhere different in the evenings. I will usually spend the morning in 1 park, rest at the hotel for the afternoon, and then head out to another park for the evening to enjoy fireworks. I like that I am not constrained to the same park I was at earlier in the day and that I can just choose on the fly where I want to go. For these extras, it does not count as days like it does for the theme parks. You get a certain number of entries according to how many days you purchase. So, if you have a 7 day park ticket, then with the plus option, you will get 7 entries in to the extras. If you decide to go to a water park and play miniature golf in the same day, then that counts as 2 of your 7 entries. You can also purchase your water park tickets separately. If you plan to only visit the water parks 1 time out of your stay, then it makes more economical sense to purchase them separately, rather than getting the plus option. Also, you can purchase them in advance, but you can also get them at the gates. Since there are no Fastpasses, there is no advantage to purchasing them in advance. When you purchase your theme park tickets, they have a certain period that they are valid for. If your tickets are part of a Disney World package, then your tickets will be valid for the length of your stay. If you are staying off-site, and purchase multi-day tickets, then you will want to check the valid dates based on what day you chose as your first visit day. Your tickets will only be valid for what you purchase. However, you do have the option of adding on a “Flexible Dates” option. With this option, you do not have to select your dates. You can just use your ticket beginning on any date (usually till the end of the calendar year), and then your ticket will be valid for 14 days from the day of first use. This will give you much more flexibility if you are not sure what your dates are, or if you would like to spread out your park days over a 2 week period. There definitely are a lot of options to choose from when purchasing your Disney World tickets. 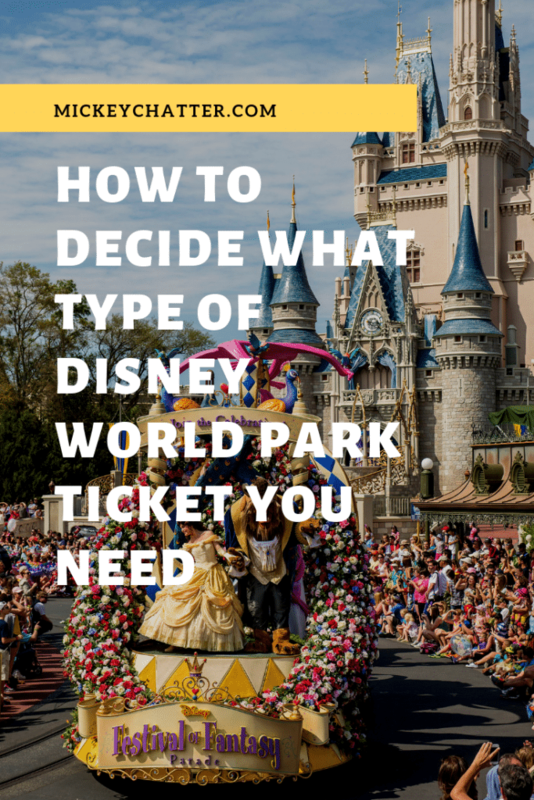 It’s just a matter of deciding how you want to tour the parks and figuring out which ticket will suit those needs. 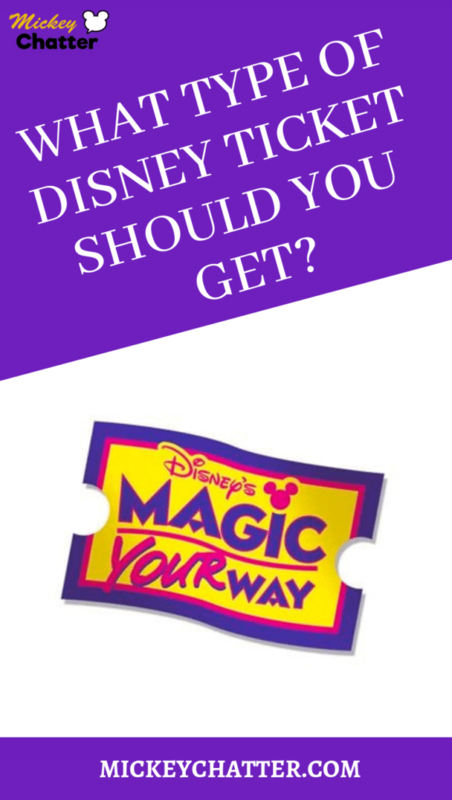 What type of ticket do you like to get when traveling to Disney World? Tell me in the comments below!